Would you like to know which vaccines have been proven by valid research to be safe? Have you ever wondered why some vaccines still contain preservatives such as mercury? Does research support a link to autism, and how did that association ever get started? Flu season is rapidly approaching, is it true that the flu vaccine contains mercury? Autism is a pervasive developmental disorder leading to severe language impairment and social interactions. Individuals with autism have a greater focus on objects than people, they engage in repetitive behaviors and usually have below-normal intelligence. Autism is usually diagnosed between 18-24 months of age due to language delay. Earlier signs of autism are usually missed such as avoiding eye contact, not returning smiles, or other lack of communication. This makes it appear to some as if something triggered a change in the child, something like vaccines. No one knows the whole story, all we know is that it is likely multi-factorial with factors such as genetics (strong link), abnormal brain development (abnormal levels of protein in the brain), older parents, environmental triggers, premature babies (under 3 lbs) and possibly closely spaced pregnancies. This leads us to our next question. Do vaccines trigger autism, and where did that claim come from to begin with? In 1998 Andrew Wakefield published a research paper in The Lancet showing a link between the MMR vaccine and autism. For 4 years other researchers tried to replicate his study and none of them were able to reproduce the same findings. After those 4 years investigators revealed that Wakefield had fabricated (made-up) the results of that study and had engaged in other dishonest activities. The Lancet withdrew the article that had been published and their has been no credible evidence linking MMR or any other vaccine to autism since. Do vaccines still contain mercury preservatives/thimerosal? Thimerosal is a preservative used in some vaccines which contains trace amounts of ethylmercury. In 2001 thimerosal was removed from all vaccines given to infants younger than 6 months. METHYLMERCURY is the type of mercury that leads to health problems i.e. Mad Hatter's Disease, named after the hat makers who used liquid METHYLmercury which leads to psychiatric symptoms, insomnia, sweating, tremors, poor memory, and red palms- notice how these symptoms differ greatly from those of autism. ETHYLmercury is a large molecule that cannot enter the brain and is rapidly eliminated from the body. How does mercury preservative (thimerosal) in vaccines compare to mercury in the environment? Questions about other preservatives in vaccines click HERE or ask your doctor. Want a list of research articles examining the evidence, click HERE. Controversy will always abound when it comes to topics such as immunizations. This is an "emotional" subject, as we all know somebody who is either very pro, or anti-vaccines. Instead of relying on individual experiences it is often helpful to step back and examine research that has been conducted on a large populations (the larger the population the stronger the research study) in order to truly understand the actual risks involved and to establish correlations that might exist. You can Examine the Evidence HERE, which is an extensive list of research and court cases regarding vaccine safety provided by the American Academy of Pediatrics. The idea is to be informed and aware so that you can make the best choice regarding immunizations for you, your family, and those around you. 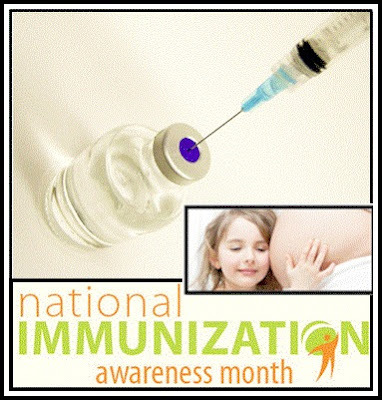 Other links to learn more about National Immunization Awareness Month! Thank you for this evidence-based article on vaccines!